Chipbreakers are a frequently misunderstood part of the cutting tools used in machining. 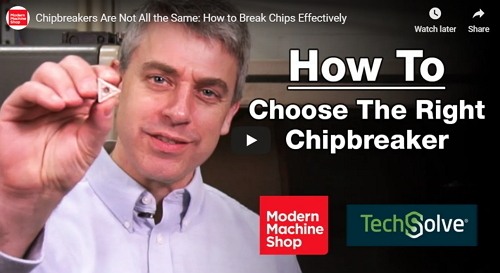 Many believe a chipbreaker is a chipbreaker—they all work the same. Not true. In fact, different chipbreaker designs are engineered for different applications, and they lose their effectiveness outside the range of parameters for which they were intended. Modern Machine Shop and manufacturing consulting firm TechSolve illustrate that point in this video, which shows the difference in effectiveness between chipbreakers used in the wrong applications and in the right ones.